Honey and milk taken together have innumerable health benefits. Honey has antioxidant, antimicrobial and anti-fungal properties. It is also very effective in treating respiratory diseases. On the other hand, milk is rich in vitamins and proteins. Also, milk is high in calcium and other minerals. What a wonder can a combination of milk and honey do? Are you one of those people who often drink milk at night? Yes, it is definitely a good practice. Also, you must be aware of the many health benefits of honey. But honey and milk when taken together can actually work wonders on your body. Right from giving energy to making your skin glow, this combination is a good treatment. How To Prepare A Face Wash? 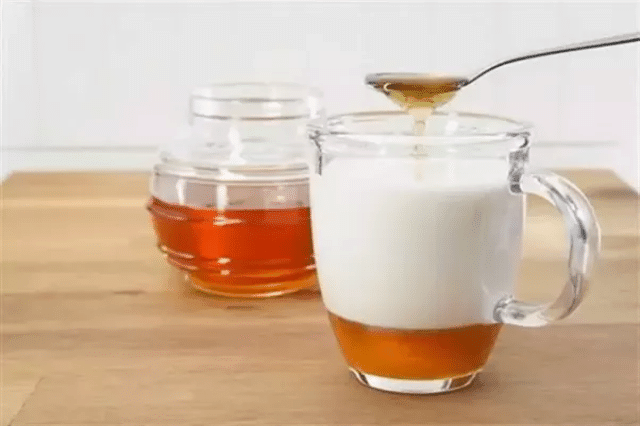 How To Make A Hair Pack Using Honey And Milk? Can We Drink Honey And Milk Altogether? Honey is a good source of prebiotics. Honey stimulates the growth of useful bacteria. Milk with a few drops of honey can help in proper digestion. Honey promotes the proper functioning of the gastrointestinal tract. It maintains a bacterial balance in the digestive tract. 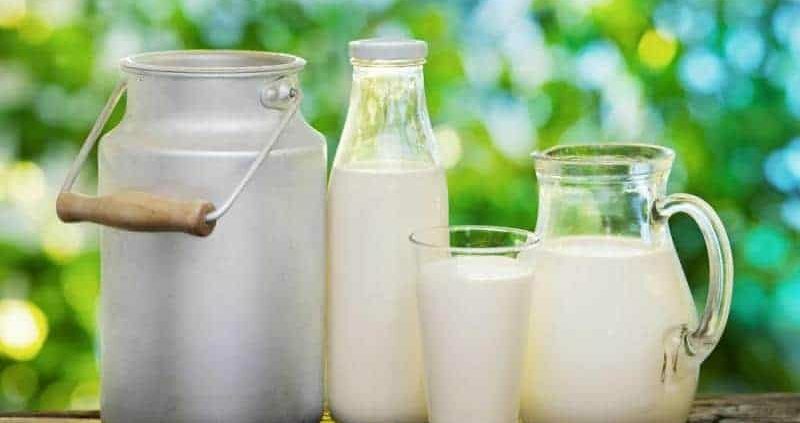 Thus, drinking milk with honey can eliminate constipation, bloating and cramps. It also prevents the bad bacterial growth. Milk is high in proteins and honey provides you carbohydrates. Together, they boost your stamina by providing energy. Honey increases your metabolism to break proteins and get energy. The proteins are broken down into amino acids. Energy is liberated during this process. Thus, honey helps in the metabolism of proteins. Honey increases the uptake of calcium by the body. Milk is itself rich in calcium. Consuming honey with milk increases the absorption of calcium in your body. Calcium helps prevent disorders like osteoporosis and inflammation of the joints. Honey is a natural remedy used to prevent insomnia and for a good sleep. 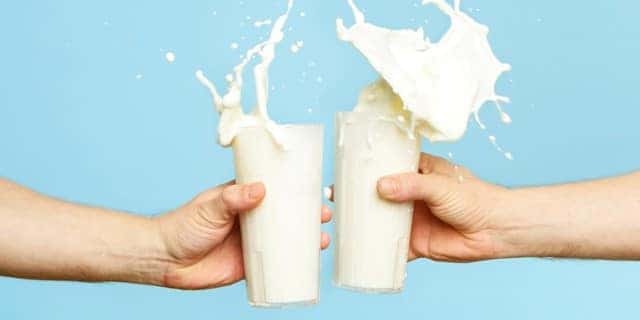 People usually drink milk at night for better sleep. Milk and honey together is a very effective remedy to treat insomnia. Honey is one of the foods that promote the release of serotonin in your body. Serotonin is the happiness hormone that induces a feeling of relaxation. It also aids in better sleep. Honey and milk are effective in kicking off pathogenic bacteria from your body. When taken together, the effect is quick. Cold and cough are viral infections. You can ward off such infections only by adding a few drops of honey to your glass of milk. Warm milk and honey lower your stress level. It is one of the best benefits of drinking warm milk with honey as honey calms your nerves and relaxes your mind. It helps you to get rid of stress. You can take this drink when your stress levels are very high. This drink can prove helpful in treating stomach infections. It has medicinal value due to its antioxidant and antibacterial properties. Honey destroys the harmful microbes from your body. Honey and milk help you focus on your work. It helps keep your mind active and lets you concentrate. Honey is an excellent ergogenic acid. It helps in boosting stamina that can improve an athlete’s performance. It maintains your blood sugar levels, muscle recuperation, and glycogen restoration. After a workout, drink warm milk with honey. It will help regulate the amount of insulin in your body. Also, it compensates for the loss of energy during the workout. Milk and honey have antibacterial properties. This combination is effective in treating various bacterial infections. It has a pronounced effect on bacteria such as Staphylococcus bacteria. Honey makes your skin smooth and glowing. It makes you feel fresh. It removes the dirt from your face and rejuvenates your beauty. It is known to lighten your skin and regenerates the tissues of your skin. You can prepare a face mask with honey and milk. Also, milk is a wonderful treatment for your skin. After days of work and exhaustion, your skin also starts looking dull. This honey and milk mask can do wonders for your skin. It removes the dirt by absorbing the impurities from your pores and gives you a smooth and beautiful skin. Milk is also an excellent exfoliant. You can use honey and milk with oatmeal as a scrub. It helps to get rid of the dead skin that makes your skin glow naturally. Applying honey and milk on the lips can also cure chapped lips effectively. Not only cleanse, but it also helps remove scars. It may also remove the chickenpox scars. Isn’t it surprising? But it is absolutely true. Acne is also another common problem that most of the women and men face. 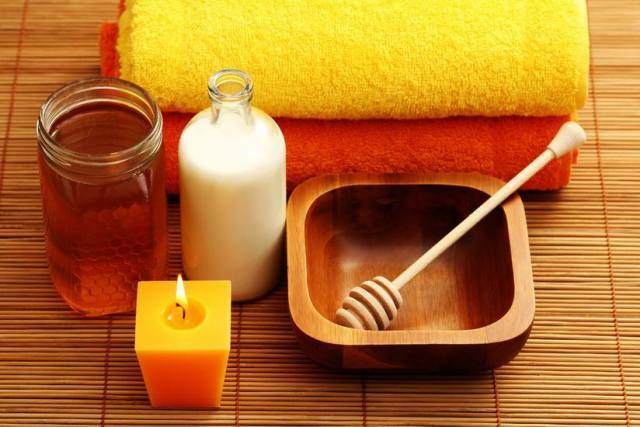 Regular application of honey and milk can reduce the redness and frequency of acne. Try it once to have glowing and fresh skin. Heat the milk and oatmeal together until the oatmeal softens. Add honey and olive oil. Apply the mixture on your face gently. Repeat once a week for a soft and glowing skin. Mix all the ingredients together in a bowl and form a thick paste. Apply the mixture to your face gently. Keep it for 2-3 minutes and rinse it off with lukewarm water. Apply a moisturizer after it. Use honey and milk face mask on a regular basis to prevent aging. As I mentioned above honey with milk works wonders on your skin. 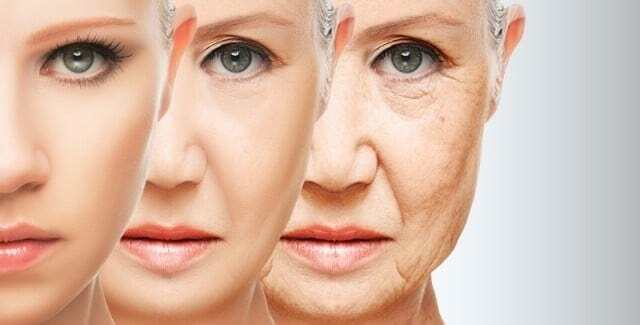 It can really prevent aging process. It makes your body agile and youthful. It helps reduce those wrinkles that may have appeared on your face. You can actually preserve your youth using this drink. The reason behind this is its antioxidant properties. The antioxidant properties attack the free radicals that affect your digestive system. Free radicals can otherwise cause skin degradation, wrinkles, and blotches. A face mask of milk and honey is a good moisturizer. It prevents dryness and dullness of your skin. Honey has exfoliating properties. You can use it as a scrub for your lips. It not only moisturizes but removes any dead skin. Drinking milk with honey cleanses your body from in and out. It flushes out toxins from your body. Milk is itself a good cleansing agent and when you add honey, you are actually getting more benefits. Using honey and milk on your hair can help repair the damaged hair. It makes your hair shiny and gives a beautiful texture. Also, your hair becomes smoother and strong. It nourishes your hair and repairs the damaged ones. Mix 2 tbsp. of honey to a cup of full-fat milk. Mix it well to make a thick paste. Pour the mixture on your hair and let it stay for half an hour. You will get amazing results. Warm milk and honey is definitely a good option to gain weight. Some people believe that it helps in weight loss. Both the beliefs are true. Actually, it is the time of consumption that matters. But it is more about calorie intake and calorie burn. There must be a balance between these two to have a normal and healthy weight. Whether you want to lose weight or gain some, you need to keep a track of your calorie consumption and calorie burn. When you drink milk with honey in the morning, it aids in the digestion process. It improves the functioning of digestive system. Usually, fats are stored in the tissues of your body that make you gain weight. Honey mobilize the fats and let them burn. The burning of fats provides you energy to perform various activities. Gradually, it will help you shed off your weight. Honey also helps in the production of good cholesterol and also reduce cardiovascular strain. So, it gets easy to digest the food you consume. A glass of milk with few drops of honey thus helps you lose weight. Ensure to drink it on empty stomach early in the morning. Also, indulge yourself in exercise after having the drink. It will really help you shed off a lot of weight. It also helps in preventing acidity when you are taking this drink. Honey is a great energy booster but always consume the natural honey and avoid the branded ones. They contain added sugars, so branded honey is left with less or no benefits. You must take milk with honey before your workout or morning walk. It will help your muscles perform better. If you are taking it post-workout, it can lead to weight gain and increase the bad cholesterol. Basically, at night this drink leads to weight gain. Actually, at night the process of digestion slows down when you take this drink. Thus, it lets your body absorb more carbs and leads to weight gain. But for that, you need to take it in large quantities and more frequently. That can lead to some consequences. Warm milk and honey help to cure a sore throat. Honey is an age-old remedy used to treat cold and cough. Your throat will feel easier and relaxed. It will unblock your nose. Chest congestion is a symptom of respiratory infection. There are different medications to treat a sore throat. But trying a home remedy is much better. Milk is not the one that helps cure a cough. But honey definitely is a treatment. Consuming raw honey can have many other consequences so it is better to dissolve it in milk. The recipe for milk and honey is given below in the article. It is very harmful if you mix honey in boiling milk. Heated honey above 40 degree Celsius is very dangerous for your body’s metabolism. It starts acting as glue and your body cannot digest it. It can lead to many consequences. Weight gain is one of the related consequences. You can also suffer from constipation and pain during excretion. So, be careful when you prepare this drink for yourself. You must follow the proper procedure to have this drink. You may think it is simple to mix honey in milk. Yes, it is simple but you must use an appropriate method to prepare it. You should try the following recipe for a delicious and healthy drink. Pour 1 cup of milk in a saucepan. Heat the milk over low heat. Do not boil it. Let it be warm only. Pour the warm milk into a cup. Stir one tbsp. of honey. Have a sip and add more honey to taste. CAUTION- The quantity of honey should not be more than 2 tbsp. Honey is rich in sucrose, fructose, and glucose. It contains many other pure carbohydrates. That means honey is very rich in calories. So, it can actually result in weight gain. Honey also contains microorganisms that can cause infections. So people with low immunity are more prone to such infections. Honey can increase the risk of bleeding. People suffering from bleeding disorders must avoid honey in milk. Honey in milk can prove to be very harmful if you have such a bleeding problem. People with lactose intolerance must avoid this drink. You can mix honey in yogurt instead of mixing it in milk. As yogurt has the enzyme lactobacillus that digests lactose, it has a reduced or no amount of lactose. When you take milk and honey regularly, the tissues of your body absorb the fats present in honey. It leads to the accumulation of fats in your tissues. But this condition occurs only when you are not using an appropriate method to prepare the drink. Chemical compounds present in honey like ‘grayanotoxins’ act as poison for your nervous system. It can damage your nerve cells. Taking honey in larger quantities can cause this condition. Milk with honey can cause some mild reactions. It can lead to hypersensitivity to some substances. Symptoms can include itching, cough, swelling, and asthma. All the above-mentioned conditions occur when you don’t take it properly. The quantity of honey in milk matters a lot. Actually, it is the thing that matters. You must take this drink of milk and honey in moderate amounts. Often, the excess use of everything is harmful and so it is. So stick to a proper method of preparation and don’t take it too often a day. Honey with water is also beneficial as water is required for the metabolism of the body. But honey with milk is more beneficial. Milk is rich in vitamins and proteins and with honey it provides more benefits to your body. The combination of milk and honey has antibacterial and anti-inflammatory properties. Honey with milk flushes out toxins from your body. It makes you stronger by increasing the calcium intake. Water and honey have no such combined benefits. It is definitely good to drink milk with honey every morning. As you have seen milk with honey is very beneficial for skin care and body metabolism. You can drink it on a regular basis but make sure that the milk is not hot. Also, take care of the quantity of honey added to milk. But it depends on you whether you want in the morning or at night. Don’t give it to the children under the age of two. It can germinate a baby’s immature digestive system. It leads to a disease called infant botulism. It is a fatal illness in children but it occurs very rarely. So, honey with milk has pros and cons. Its unique advantages are great. But you can enjoy the benefits when being careful while preparing it. You can use it to treat stomach infections, cold, and cough, and boost your stamina. This drink definitely tastes delicious. Honey is itself a home remedy for various disorders. 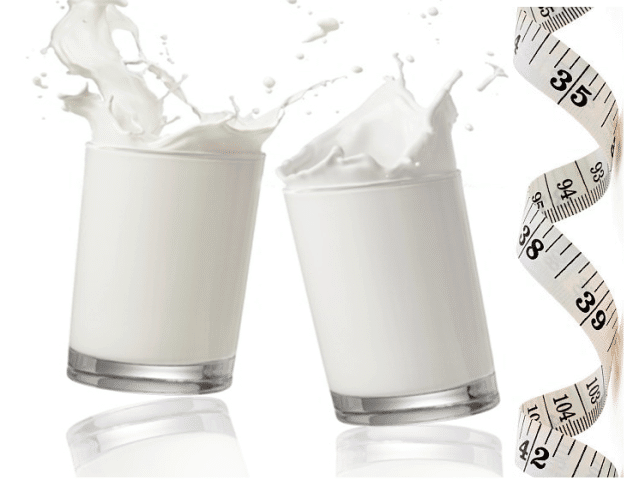 Milk has also various roles in providing nutrients and vitamins to your body. Including their combination in your routine can actually work wonders. Stick to a less amount of honey in milk. Take care of the precautions and side effects it can cause. So, enjoy your treat and stay healthy.